This post was supposed to go up on 16/6 as a tie-in between the 24 Hours of LeMans and 1:66 scale models, but I never got around to it. Whoops. Last year, I lamented not having a French or Le Mans 1:66 cast for Friday, June 16th, and I would’ve had one this year if I posted on time. This one is the Martini Racing version (silver with blue); the casting was also released in a Gulf livery (blue with orange). 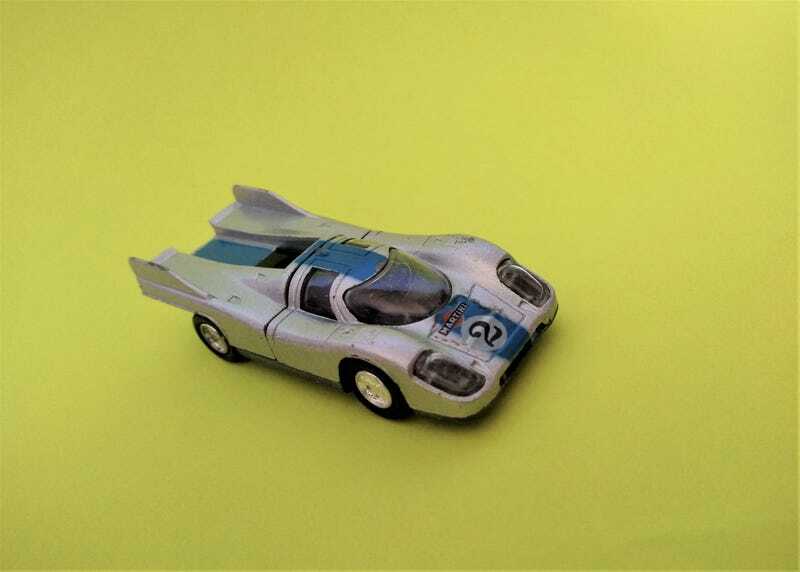 As this Schuco 1:66 was released as a toy back in the early 1970s, the simplified paint scheme doesn’t quite represent any actual chassis as run at Le Mans, and the castings could sometimes be found with the same livery but with different numbers. Detail is fairly good, with clear headlight covers, body panel lines, and vents on the front fenders. A couple of bucket seats are visible in the interior, though the glass on this example is quite scratched. Detail under the engine cover mostly consists of the large engine fan on the top of the flat-12 engine. The rest of the mechanical details are found underneath. Underbody detail is nice as well - there is molded detail for the transaxle and chassis in the rear. Typical for vintage Schucos, some specs are listed underneath. This was a fairly cheap eBay find in decent condition. The glass has quite a bit of dust/scratching, and there is some wear on the raised edges, but what I’m most annoyed at is the colouring on the wheels on one side - there are some pink splotches that don’t appear to be removable.